Address 541 E. Mendenhall St.
Info Franke Wilmer is running for the United States Congress because she believes in public service and improving the lives of others. Franke Wilmer believes we must create an economy that produces family wage paying jobs for the working families of America; we must balance the budget and bring down the national debt, protect our environment, strongly support choice and strongly promote peace. Franke Wilmer has strong roots in Montana. Her mother, Marion Wilmer, was born in Terry, Montana, to a homesteading family. After several years of drought and a fire that destroyed the ranch, Franke's mother and grandparents moved to the eastern shore of Maryland. Her father, Henry "Bud" Wilmer, was a bricklayer and her mother was a nurse. Her brother John is retired from a career in the United States Air Force. Franke worked sixteen years in a variety of hourly wage jobs including carpenter, waitress, legal secretary, and retail sales while she completed college and graduate school. While in graduate school she also taught middle school as a substitute teacher. Scholarships helped her complete a Ph.D. in Government and Politics at the University of Maryland in 1990. 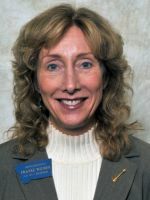 Franke Wilmer came to Bozeman in 1991 to accept a position on the faculty of Montana State University. Her research has focused on war, ethnic conflict, and indigenous peoples' self determination. Franke has written three books, numerous articles and been an invited guest lecturer in the US and abroad. She conducted field research in former Yugoslavia during the war and over five years following the Dayton Peace Accords. She is a proud member of the Montana Education Association - Montana Federation of Teachers AFL-CIO. Franke took on a leadership role in the efforts that led the Montana State University faculty to join the union. Franke has been involved in community service in Bozeman and after Governor Schweitzer appointed her to Chair the Montana Human Rights Commission she became interested in being more involved in public service. This led her to run for the state legislature in 2006, being elected then and again in 2008 and 2010. Franke has also served on the "Governor's Capital Financial Advisory Council" and is currently the Legislative Liaison to the Board of investments. She has served on the House Education Committee and the State Administration and Veteran's Affairs Committee in all three sessions. During the 2007-2008 interim she chaired the State Administration and Veterans Affairs interim committee. In the 2009-2010 interim she served on the Environmental Quality Council. She was elected to serve as Speaker Pro Tempore of the House in the 2009 legislative session. The Vietnam Veterans of America Montana Council selected Franke as "Legislator of the Year" in 2011.